Oscope is a statistical pipeline for identifying oscillatory genes in unsynchronized single cell RNA-seq experiments. Oscope capitalizes on the fact that cells from an unsynchronized population represent distinct states in a system. 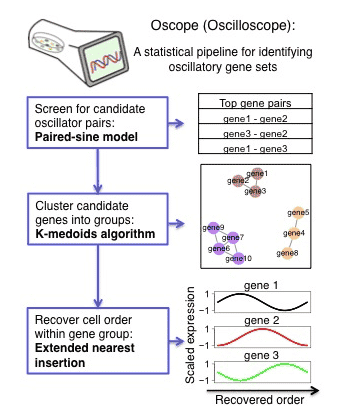 Oscope utilizes co-regulation information among oscillators to identify groups of putative oscillating genes, and then reconstructs the cyclic order of samples for each group, defined as the order that specifies each sample’s position within one cycle of the oscillation, referred to as a base cycle. The reconstructed order is based on minimizing distance between each gene’s expression and its gene-specific profile defined by the group’s base cycle allowing for phase shifts between different genes. Oscope was built under R version 3.2.1. R is a free and popular statistical software package. The demo runs through many of the commands contained in the vignette automatically, using simulated data for illustration (it will take a few minutes). To apply Oscope to a particular dataset, the commands within the vignette may be followed once that dataset is read into R.
06/24/2015 Oscope 0.99.1 is available on Bioconductor now!